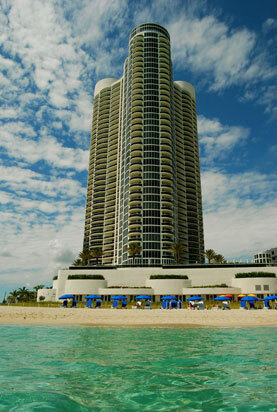 Ocean Four condominium is located in Florida's Riviera - in the beautiful new city of Sunny Isles Beach - appropriately named as it is almost always sunny and beautiful! Situated on a gorgeous white sandy beach with over 300 feet of beachfront paradise and lushly landscaped grounds, Ocean Four consists of 282 fabulous units ranging from 1301-3018 sq ft. Each condo features modern open kitchens with custom cabinetry & Miele and Sub-zero appliances, floor-to-ceiling impact glass, large terraces, and spacious floor plans. A multitude of views are offered from each unit, including breathtaking ocean views, sparkling city vistas, and the intracoastal waterway. Each floor plan in Ocean Four maximizes living space and views. The building is divided into 3 towers, which each floor consisting of only 2 to 3 units which allows for maximum privacy and security. A friendly staff is sure to make you feel welcomed at Ocean Four- from the front desk concierge to the beach and restaurant staff, your needs are always met. The full service sit-down beachfront restaurant offers a gourmet freshly prepared daily menu, in-home catering, and food & beverage delivery on the beach, near the pool, or in the common areas. Comfy lounges with towels & umbrellas are provided on the beach and paddle boarding and other activities are available for the adventuresome set. Enjoy a state-of-the-art fitness center, yoga, Tai Chi, and dance classes, massage room, conference room, billiards table, huge lounge, heated oversized pool, jacuzzi, locker rooms with steam and showers, and an amazing pool deck. Ocean Four's location makes it particularly appealing to those who love convenience. Directly across the street is the famous Epicure gourmet market and deli with outdoor dining and jazz music on weekends. Less than a block away is Starbucks and a multitude of dining, shopping, and banking venues. For those with children, a wonderful park is directly across the street featuring lots of fun children activities and year-round events. The world-renowned Bal Harbour Shops and the Aventura Mall offer an unparalleled shopping experience and are each about a 5 minute drive away. Live in Paradise at OCEAN FOUR! !